Wells House, ca. 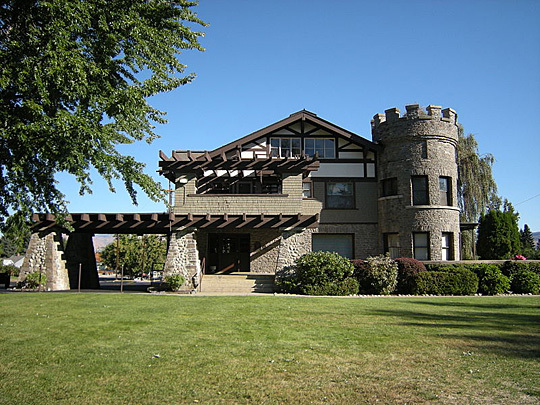 1909, Wenatchee, Washington; built for W. T. Clarke. Listed on the National Register of Historic Places in 1984. Photographed by Joe Mable (own work), 2008, [cc-by-3.0 (http://creativecommons.org/licenses/by/3.0)], via Wikimedia Commons, accessed September, 2012. Washington is famous for scenery of breathtaking beauty and sharp contrasts. High mountains rise above evergreen forests and sparkling coastal waters. The deep forests of the Olympic Peninsula are among the rainiest places in the world but the flat semi-desert land that lies east of the Cascade Mountains stretches for long distances without a single tree. Snow-covered peaks tower above the foothills and lowlands around them. Mount Rainier, the highest mountain, in the state, appears to "float" on the horizon, southeast of Seattle and Tacoma. In 1853, the Washington Territory was formed from part of the Oregon Territory. Its coastal location and Puget Sound harbors give it a leading role in trade with Alaska, Canada, and the Pacific Rim. The state has two major mountain ranges — the 7,000-foot Olympic Mountains surrounded by temperate rain forest on the peninsula west of Puget Sound, and the more majestic Cascade Range, which boasts the 14,410-foot Mount Rainier and the volcanic Mount St. Helens, which erupted twice in the 1980s.